What do you do in Snowboard Lessons? Snowboard lessons will introduce you to the equipment used in snowboarding, take you to the correct places to learn to snowboard, and teach you to snowboard in safety. Snowboard lessons use lots of different exercises and practices to get you to put your body in the correct positions, and make the correct movements. How Long are Snowboard Lessons? Snowboard lessons are generally between 2 and 4 hours long (although not always), 2 hours being a half day and 4 hours being a full day. This may not sound like much, but 4 hours of learning to snowboard for someone who does not snowboard often, or has never snowboarded before will normally leave them pretty tired. It can often be found that if people do more than 4 hours they just don't have the energy to snowboard properly any more and their technique suffers. 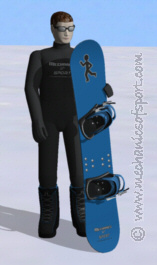 There are generally 2 types of snowboard lessons, Group Snowboard Lessons and Private Snowboard Lessons. Group lessons are where you are put into a group of people that are all roughly the same standard, and the instructor will take you through exercises on different slopes to improve everyone's snowboarding. As you can be in a large group of people with group lessons, the instructor will only be able to pay so much attention to you, and the exercises done will generally have to suit the overall needs of the group. Group lessons can be very good fun though, as being in a group of people can have a very sociable side to it. Private lessons are where you have an instructor to yourself (or with the other people you have booked the lesson with). This is the quickest way to learn as you will have all the attention, and all exercise can be suited to exactly what you are doing. Private lessons will work on mistakes as soon as you start to make them, so that it is harder to get into any bad habits. Between the 2 types of lessons though there can be a large price difference, so although private lessons might be what you would like to have, a lot of people go for group lessons because it fits their budget better. One last thing to say about snowboard lessons is that it is always nice to give your instructor a tip at the end, especially if you have learnt a lot. Although your snowboard lessons may have been quite expensive, it is very unlikely that your instructor will see much of that money, and a tip can often make a big difference to how they get by. On to the Useful Skiing Pages section.